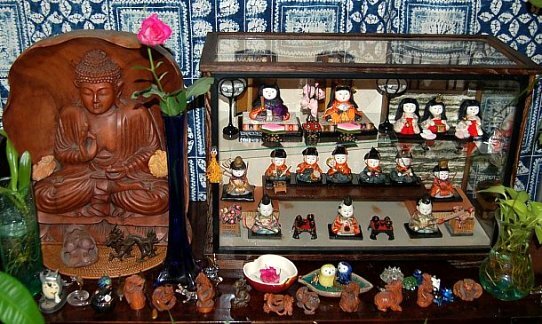 Japan’s Doll Festival (Hina Matsuri 雛祭) has a very curious history, one largely forgotten in contemporary times. Held on March three every year since the mid-to-late Edo period (1600-1867), it was originally a day for ritual purification known as Jōshi no Sekku 上巳の節句 (literally “Seasonal Festival of the Snake”) when people would rub their bodies with crude human-shaped figurines made of paper, straw, clay or wood. These figurines served as “scapegoats” for exorcising spiritual pollution and bad karma. The word for snake (Jōshi) sounds like the word for girl (Joshi 女子), and the festival eventually became geared towards girls. The first sekku 節句 (seasonal festival) after the birth of a baby girl, it is now a day when charming dolls are set out for display to symbolize the family’s wish that their daughter will be healthy, free from calamity and able to obtain a happy life with a good husband. But it was not always so. Click the image below to read more, or click here. This entry was posted on Sunday, March 3rd, 2013 at 3:23 am	and is filed under Uncategorized. You can follow any responses to this entry through the RSS 2.0 feed. You can leave a response, or trackback from your own site.